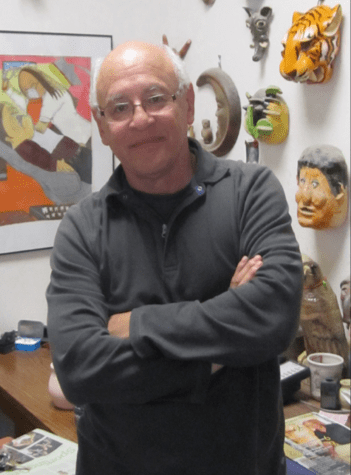 Delta College is diverse, unique and inspiring — much like art professor Joe Mariscal. Mariscal’s journey is adventurous and rare. At the time Mariscal, was attending school in Mexico. He originally went for pottery, and then ended up switching to art history. “When I came home he said hey I don’t want to teach at night anymore would you like to teach and I said I’ve never taught before,” said Mariscal. Off to a rocky start, Mariscal didn’t have the best experience teaching his first class. Mariscal said he had a student come back five years later that was in his first class. She told him that she felt so bad for him because there were only five people left in his class at the end of the semester. Therefore, she didn’t drop his class. She told him he had improved a lot from the first class he taught. Incidents such as this are what encourage Mariscal to continue teaching, first as a longtime adjunct, then as a full-time professor. Mariscal looks back and appreciates that he had someone such as Duke as a professor at Delta to see his gift for teaching. “He was the one that taught me the ceramics, he obviously thought I had something that he saw in me, I guess he was right I’ve been here since then 1975 to now,” said Mariscal. However, Mariscal has teaching experience from different institutions as well. He taught at the Deuel Vocational Institution in Tracy and also at the Alan Short Center, a Developmental Disabilities Service Organization. At one point he was teaching at all three institutions at the same time. Besides being a professor, Mariscal is a well-rounded person with an intuitive mind for art. An interesting fact about Mariscal is that he doesn’t own a cell phone. He says he’s never owned one, simply because he can survive without it and cell phones make life more complicated in the classroom. Students seem to be constantly on their phones, which interrupts his classes. There were definite experiences in Mariscal’s life that made him who he is today. Some would say Mariscal’s unique story has a lot to do with chance and luck. However, it also took a lot of dedication and hard work. Irony plays a role in Mariscal’s life as well — one of his students is also teaching in this department. The student knew what he wanted to do after taking his class. “It was totally by accident it was totally by circumstance and I think life is like that if you keep your eyes open and you meet the right people that as long as you’re pushing towards a goal things pop up and if you take advantage of them then they turn into something sometimes and that’s what happened to me,” said Mariscal. A year from this semester Mariscal will be retiring. He plans on returning to Brazil. He wants to teach and enjoy the Brazilian culture.